Poly Pak Model CFH16-32VL, automatic shrink wrap (full enclosure) and traying line capable of 10 to 50 cycles per minute with number of product – depending on materials and application. Shrink bundles: up to 12" in Width x up to 9" in Height. Trays: up to 16" in Length x up to 14" in Width x up to 7" in Height. Line consists of Poly Pak CFH16-32VL shrink wrapper with jar orienting pre-feed, shrink tunnel, product laner and connecting conveyor to a Poly Pak TR 25 wrap-around tray erector and packer. Mounted on heavy duty frames with leveling legs. 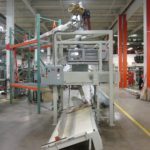 Moline complete doughnut, cutting, depositing, frying, cooling and sugar coating line with number of donuts per hour – depending on type and size being run. Line consists of DCA stainless steel, 18 head donut dough cutter, depositor with dual dough hoppers, feeders and 18 cutting heads mounted over Moline direct gas fired, hot oil fryer with 230" long x 44" wide chamber with 40" of workable fry area, top and bottom roller conveyor sections with center in-line donut turner, modular exhaust hood fits directly over fryer and pnuematically lowers and raises without ceiling supports. I J White (9)-tier, stainless steel, spiral, desending, ambient air cooling system with 30" wide total, 28" wide usable 1 x 1 stainless steel flex mesh product belt, overall length of 640′ and effective cooling length of 582′ with 6" tier pitch and 11′ 10" product in feed and 6′ 10" product discharge heights, to Moline continous, stainless steel, powdered, granulated or cinnamon sugar donut drum coating system has 24" ID x 88" long coating drum with 1" long x 1/2" wide inside perfs, 36" long in feed and 24" long discharge chutes and a 10" OD end sugar recycle chute to stainless steel reclaim suger bin with inner and outer paddles as well as 4" OD stainless steel bottom feed screw to 80" long incline cleated feeder with 6" wide belt and 1-1/2" high cleats set on 6" centers with cover. All mounted on stainless steel base frames and have individual controllers. Thiele complete, automatic bag filling line rated from 2 to 6 bags per minute – depending on materials, application and machine configuration. Line consists of a Thiele bag hanger, Hapman screw feeder, Merrick weigh feeder, stainless steel hopper and St. Regis V-Trough discharge conveyor. Capable of handling bags: gusseted sewn open mouth or pinch bottom (Heat Seal) bags multi wall bags with (face width of 11" to 18"; Length of 25" to 37"; Gusset of 1.5" to 4.5"). Equipped with 144" long empty bag magazine, vacuum pick and place, screw feeder, 48" long loss in weight feeder, bag filling spout, and 264" long V-Trough discharge conveyor. Stainless steel contact parts. Appropriate Bag Sealer available at additional cost. Complete line Motor Oil filling and capping system with number of bottles per minute – depending on materials and application. Equipped with Horix 24 head piston filler cuurently set with 32oz pistons, and Alcoa 6 head capper, with worm screw to star wheel in feed and discharge. Maximum container sizes to 7" diameter (or 6 3/4" rectangular bottles). Casa Herrera, complete, stainless steel tortilla chip processing line. Rated from 300 Lbs to 1600 Lbs of product per hour – depending on materials and application. Line consists of Casa Herrera Model CG, stone mill with 14" diameter stones and 2" diameter screw that feeds the corn between the stones with 30 Hp. motor drive. Product is then conveyed through the Masa Feeder, which is a feed hopper with twin screws. The product is forced into a 1" sheet above the sheeter rolls. The sheeter is a Model S-1600 which forces the product through (2) Rolls into a sheet and presses a set of cutting dies up against the sheet to cut out the desired chip. All mounted on stainless steel base frames. 72" long x 17-1/4" wide canvas transfer conveyor to Arpac Model 45TW-28 shrink bundler and tunnel with (1) 36" x 19" wide and (1) 36" wide x 72" long in feed conveyors thru bundler, top and bottom film rolls with maximum film roll width of 27" and 14" OD has 29" wide seal jaws x 13" high total clearence, to single zone shrink tunnel with 36" wide x 19-1/2" high total aperture x 72" long shrink chamber with 29" wide x 108" long product conveyor thru shrink tunnel with top discharge cooling fan. Control panels have A/B controllers with touch pad controls. and readout. All mounted on heavy duty base frames with safety guarding and statis light bars. Ohlson Packaging, complete combination weigh scale, bag filling system with number of bags per minute – depending on materials and application. Line consists of Olsen stainless steel bucket elevator with 15" long x 4½" wide x 3½" deep plastic buckets and has 26" long bottom feed horizontal run, to 142" long vertical run, to 72" long top horizontal run with 150" discharge height into the Ohlson 14 head stainless steel combination weigh scale system with strain gauge load cells and has a weight range from 25 to 500 grams with accuracies of ± 0.5 grams, capacities from 500ml to 2500ml. Has product in feed funnel, with (14) 11½" long vibratory linear feed pans to (14) 6" long x 4¾" wide x 9" deep feed buckets, to (14) 6" long x 4¾" wide x 9" deep weigh buckets and 10" wide x 30" long product collating discharge chutes. Mounted on 78" x 78" stainless steel platform with stair access and safety rail guarding and to Bandrite, Model 6000 automatic, continuous motion, band style, bag sealer, with bag trim station, 1 line coder, ¾" wide heat sealing bar and cooling bar, angled sealing and tilt away drive head, non-marking carrier belts with adjustable running speeds and temperature controls up to 600 Deg F. Hand crank height adjustable and 6" wide x 100" long belt conveyor with adjustable guides and powered by a ¼ Hp drive. Raque Model 4580 series, complete stainless steel, intermittent motion, tray denesting, filling, topping, and roll stock heat sealing line with number trays per minute – depending on materials and application and line configuration. Line consists of Raque (3) head reciprocating suction cup tray denester with 120" long workable x 24" wide (3) lane plastic flexlink tray conveyor sections with 3-1/2" long x 3/4" high lugs set on 10-3/4" centers, has no tray / no fill sensers with (2) Raque topping dispenser on 93" long workable x 24" wide lugged conveyor section with no tray / no fill sensors. Filled trays, are then conveyed to Raque (3) lane, roll stock, heat seal, die-knife cut sealer with 28" long film rolls on 1-1/2" cores roll stock film mandrels with 20′ long x 24" wide tray conveyor and (3) 9-1/4" long x 8-1/4" wide pnuematic pressure, heat sealing heads with die-knife cut-off and film scrap rewind. Control panel has CPU controls and control panel with digital display, on / off seal head switch and start, stop, e-stop push button controls. All mounted on heavy duty stainless steel base frames.